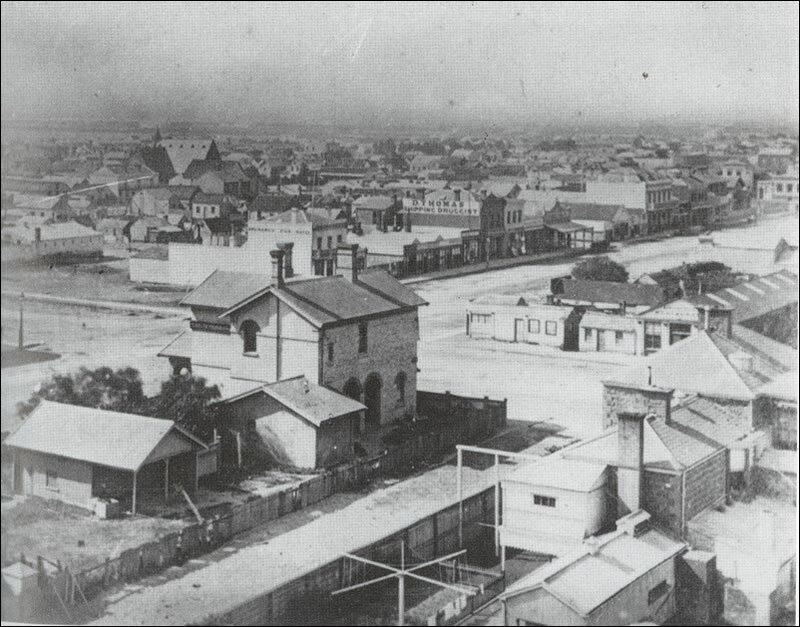 At first glance, this is a rather plain black & white photograph of Sandridge (now Port Melbourne) taken in 1873 except if you look closer, you will see something quite remarkable. That's 38 years 'before' Gilbert Toyne, a local Geelong farrier and wheelwright, first patented his Aeroplane Rotary Clothes Hoist in 1911, and 73 years before the Hills hoist was developed by Lance Hill in 1946. 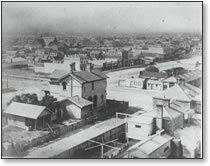 The Port Melbourne photograph taken for the 1872-73 Victorian Exhibition provides material evidence of a rotary clothes line in use in a Rouse Street backyard. In her article Port Melbourne History on the Line, June Torcasio examines the provenance of the rotary line by trading its history and concluding that the Port Melbourne version could have been installed there as early as 1860. In the Heritage Collection of the city of Port Phillip, a set of twelve photographic prints made for the 1872-73 Victorian Exhibition has survived to provide us with graphic visual evidence about the suburb. Among these photographs is an image of a rotary clothes line in Frederick Poolman's backyard in Port Melbourne. What was such a "modern" invention doing there at that time? Lawrence Money in 1985 had presumed the image to be from around 1900. To investigate this problem, I turn to the international exhibition phenomena and the provenance of the photograph. During the second half of the 19th century, numerous exhibitions in different parts of the world ostentatiously displayed Victorian goods, reflecting an acute sense of industry and progress. These exhibitions ranged from colonial, to intercolonial and to international. The Victorian Exhibition held in Melbourne from 6 November 1872 to 8 January 1873 displayed "almost exclusively Victorian" products intended to be shown at the International Exhibition in London from 14 April to 31 October 1873. On 7 August 1872 Edward Clark, town clerk of the Borough of Sandridge, issued an invitation to all those in the community interested in entering goods for show, noting that "the Council would be glad to receive suggestions from intending exhibitors or other persons interested in the matter". Item 202A in the photography section of the official catalogue listed Sandridge Borough Council's contribution of "Photographic Views of the Borough". As a result of the foresight of the Port Melbourne Council in preserving photographic records, the City of Port Phillip Heritage Collection holds this early set of prints displayed in the original decoratively painted mount and frame. The lower centre of the mount bears the painted inscription "View of Sandridge taken for the International Exhibition 1873". To read the complete article, visit Royal Historical Society of Victoria web site and become a member.